Are Long Island Consumers Addicted to Debt? Some of the major reasons consumers seek bankruptcy relief typically include medical expenses, death in the family, loss of a job or decreased salary, and matrimonial issues. However, America’s addiction to debt is certainly a significant reason — especially here on Long Island.. The fact is that high levels of household debt push consumers into seeking bankruptcy relief. 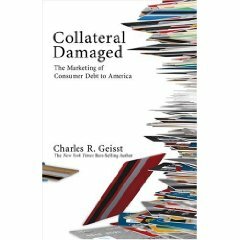 The concept of debt addiction is the subject of a new book, just published last month, Collateral Damaged: The Marketing of Consumer Debt to America, written by Dr. Charles Geisst, Professor of finance at Manhattan College. Dr. Geisst believes that sometime in the 1970s and 1980s, the use of credit cards, which had begun as a convenience, began to grow into an addiction. Banks then took advantage of this addiction milking consumers with exorbitant interest fees and service charges. Then Wall Street took advantage of the situation by creating “toxic securities” that are now threatening to bring about a collapse of the global economy, continuing where the toxic securitization of the mortgage market left off. In his book, Dr. Geisst delivers a scathing critique of the routine practices of the credit card industry that led to the current consumer debt crisis. It seems that banks became greedy after realizing that simply making loans to consumers to buy a home or car was not enough. The banks became increasingly interested in the high profit margins of these loans and other types of consumer debt, and then sought increasingly sophisticated ways to market them, eventually leading to the bursting of the credit bubble last year. In my Long Island bankruptcy law practice, I see first hand the debt addiction that many families encounter, and their inability to escape from the ever-deepening abyss of credit card bills. Fortunately, bankruptcy acts as an escape valve, enabling these clients to eliminate their debts and get a fresh new start. Several years ago the credit card industry pushed hard for bankruptcy reform to make it harder for consumers to seek bankruptcy relief. Ironically, they have also created a situation which is now driving consumers to file for bankruptcy in droves . It is expected that 1.4 million Americans will file for bankruptcy this year . You can listen to an American Bankruptcy Institute podcast of Dr. Geisst being interviewed by the Sam Gerdano, Executive Director.